I realised that although I had mentioned making a wedding card for a colleague, I had not actually put it up here. N was returning to Sri Lanka for a very colourful and vibrant wedding, and I wanted to reflect that in my card design. So here it is – brightly coloured and using one of my favourite papers. Fuchsia cardstock folded in half to A6 size. Light pink cardstock trimmed to be slightly smaller than A6 layered on top. 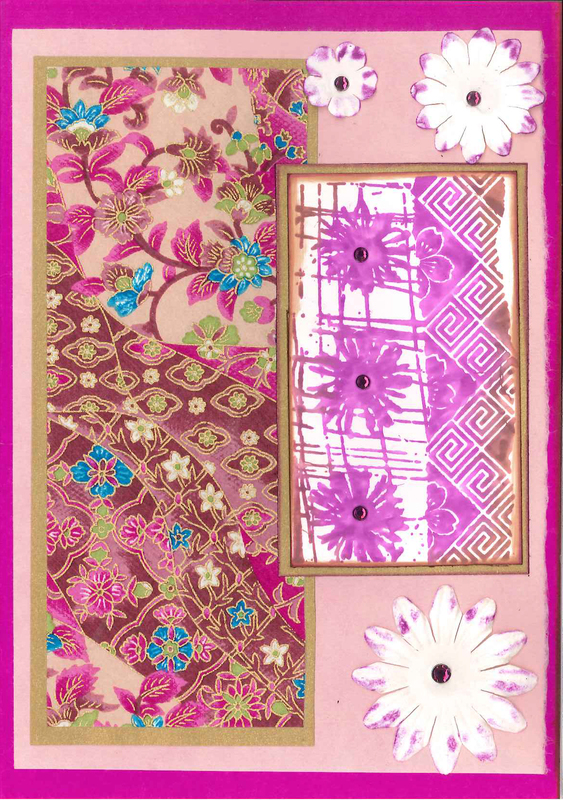 Chiogami paper with pink and purple patterns (my favourite!) layered onto gold paper then onto the left hand side of the pink panel. Dandelion woodprint by Christine Adolph was stamped in Adirondak Wild Plum ink edged with Vintage Photo distress ink. Vintage photo ink swiped around the edges, then layered on the right of the pink panel, overlapping the chiyogami paper in the middle. Three paper flowers of different sizes edged in Wild Plum ink, attached to card. Purple gems added to the centre of the paper flowers and the flowers on the dandelion woodcut image. The envelope used a strip of the same chiyogami paper, and two paper flowers edged in Wild Plum, stacked together and attached with a purple gem in the centre. The patterned part of the Dandelion Woodcut stamp was inked in Vintage Photo and stamped at the bottom. Vintage Photo ink swiped down one side. Although the chiyogami paper has a different pattern to the stamp, there was something about the two I felt worked well together. 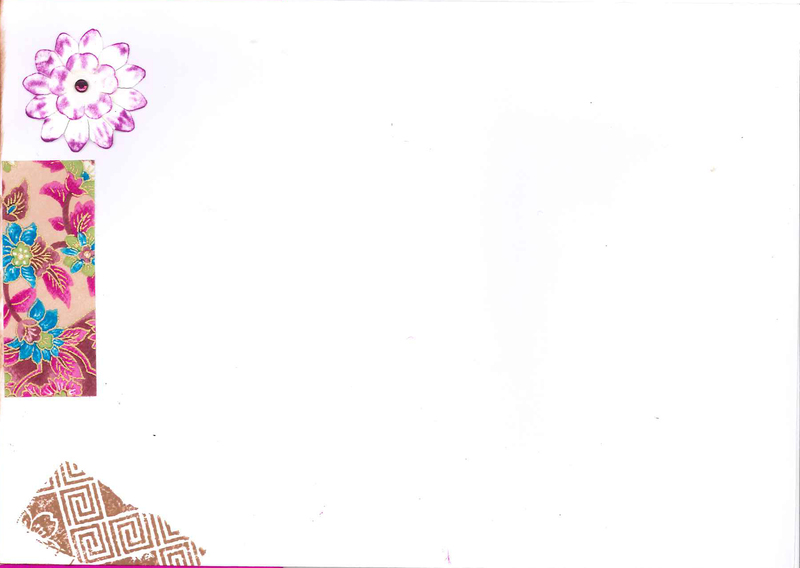 By using the purple ink and also the repeated flower motif, I tried to tie them so there was a feeling of balance.